Planning a school trip and need some inspiration? In our quest for the best, we’ve hand-picked 10 top school trips that your students will cherish for a lifetime. Interlaken, a town considered by many as the adventure mecca of Switzerland, offers the best of thrills and challenges for your students. Get them outdoors and active in the Seilpark Interlaken, a forest adventure park packed with Tarzan swings and zip-lines. Alternatively opt for an enchanting tour of the nearby fairytale-esque castles and feel like royalty. All this and much more can be booked through our award-winning Interlaken Youth Hostel, ideally located next to Interlaken-Ost Railway Station and at the foot of the magnificent mountain range of the Eiger, Mönch and Jungfrau. 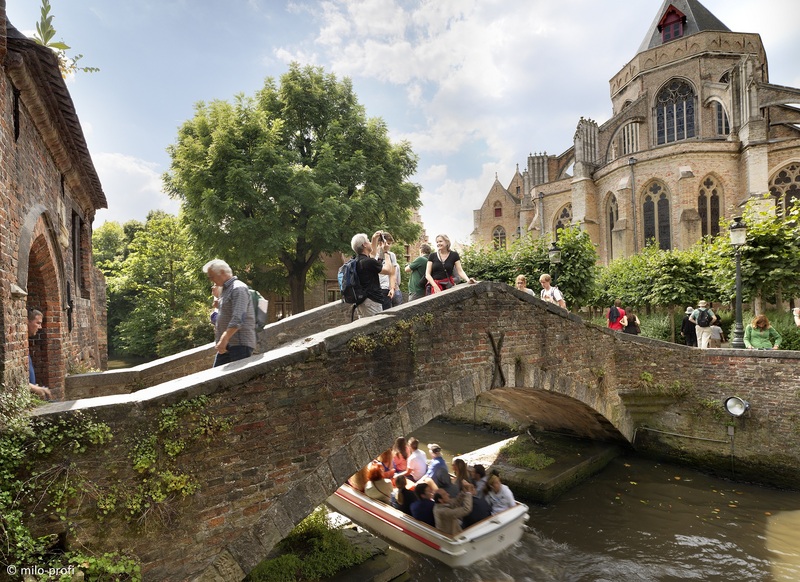 Organise your school trip to medieval Bruges in Belgium, known as the Venice of the North for its scenic waterways and quaint bridges dotted around the city. Create unforgettable experiences and bring those stories from the textbooks to life through visiting areas of ancient architecture, museums and major WWI battlefield sites. Why not treat your group and take them to the Chocolate Museum to taste some of the best chocolate in the world? After a day of exploring, head back to the Bruges Europa hostel, ideally located away from the crowds, and unwind in its spacious garden. Enjoy a real-life tale of two cities, a charming Bergamo that is divided into Bergamo Alta, a medieval city at the foothills of the Alps where you can find galleries and historic highlights, and Bergamo Bassa, a lower town with vibrant shops and bars. Discover this charming city in the most original way, gather your students and pick from one of the experiences organised by our friendly staff at Bergamo hostel. You could even take a full day excursion and follow in the footsteps of the great Pope John XXIII or go for the mystery tour of the underground cities. As a vibrant multi-cultural city, London is a perfect school trip choice that will excite, educate and expand your students’ minds. Take an educational cruise of the Thames, explore Ripley’s Believe it or Not interactive exhibits, catch the West End dramas, discover an underwater life in the Sea Life London Aquarium or educate your students about Shakespeare’s plays by taking a visit to the Shakespeare’s Globe. The possibilities are endless. Take advantage of everything that London offers, stay at YHA London Thameside and enjoy discounted ticket prices that can be pre-booked or sold directly at the reception. Explore Cologne by foot, climb the towers of the Cathedral, and learn lots about history along the way. Plan your educational school trip with ease and pick from multiple itineraries on offer at our modern and well-equipped Riehl City Hostel, ideally located right in the thick of things. Walk along the ancient city walls, visit the German Sports and Olympia Museum and take a cable car ride across the River Rhine to ignite a spark of excitement and thirst for knowledge in your students. Uncover Strasbourg’s unique atmosphere on your next school trip by visiting the European Parliament for education in politics and other sights within the UNESCO World Heritage Site. Take a guided boat ride, climb up the hill to see the magnificent Haut-Koenigsbourg Castle, and teach them about the hard-hitting history of Natzweiler-Struthof, a German concentration camp. So whatever your reason for visiting Strasbourg with your class, our Hostel 2 Rives here will provide the perfect base for your trip. Discover all the sights and sounds that Barcelona offers and make your school trip truly inspirational for your students by visiting Gaudi’s radical designs, the magnificent Sagrada Familia and the impressive and architecturally fascinating Park Güell. From the narrow cobbled streets of the Gothic Quarter to the famous promenade of Las Ramblas, this cutting edge and cosmopolitan city will introduce your students to local culture, its customs and delicious food. From our Mare de Deu Montserrat Hostel, located away from the hustle and bustle of the city, you can also take a guided tour to discover the beautiful landscape of Catalonia by climbing the Montserrat Mountain to see the ancient monastery and enchanting views of the Pyrenees. Home to US president, the seat of power at the White House, and many grand government buildings, the capital city of the Unites States Washington D.C. is where your students will be able to soak up the political history of the nation. Take the guided tour around the US Capitol Building, hear the stories about the country’s struggles and democratic movements and afterwards, gather at the National Mall, a central spot for endless sightseeing opportunities. Plan a valuable hands-on experience for your students and stay in the enriching environment of our HI – Washington DC hostel.